On Wednesday, December 16, Sweet: A Literary Confection held its first fundraiser. After eight years of running primarily out of our editors’ pockets, Sweet was looking to dig a little less deeply into personal accounts to achieve some of the most noble goals a lit mag can aspire to: paying contributors for their publications, creating local and international writing workshops, and expanding its chapbook press. All said, it was a success—we raised $1,300 thanks to generous donations from a number of former and forthcoming contributors and Sweet friends and staff. We had prints by Dinty Moore; signed books, chapbooks and book sets for days; a space in Chelsea Biondolillo’s online workshop; Sweet swag; an essay workshop with Brenda Miller; and an entire table of homemade bookmarks. But perhaps more impressive than the funds or donations was the sense of community, of camaraderie, that underlay the entire event. It is easy to become isolated in the act of writing, to become immersed in a computer screen and translating half-formed ideas into words that will eventually fill the screen. But Sweet is a literary journal that seeks to form connections and bring writers together in a space where we will listen to and support one another, and Wednesday’s event did just that. Writers at all stages of their writing lives, supportive loved ones, and interested and curious parties gathered together at the fundraiser in support of the literary community. Ira Sukrungruang, one of Sweet’s co-founding editors, opened the evening’s reading series with an introduction to the magazine and a piece from his forthcoming short story collection, The Melting Season. A number of former contributors and Sweet staff members also read from previous issues. Sarah Viren, writer-in-residence of the Kerouac House, read several short pieces, one entitled “Two Lines”—a short essay about two possible pregnancies—which will be published next month in Sweet 8.2. We also got to hear and see some great comics. 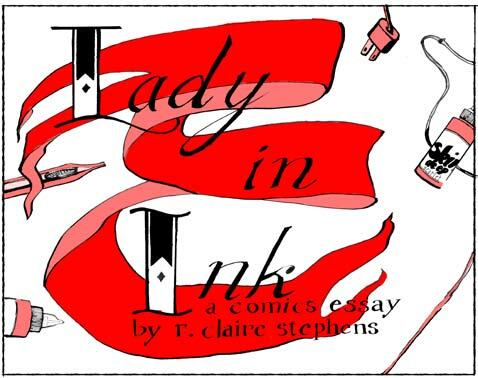 R. Claire Stephens read her illustrated essay, Lady in Ink, which was recently published by Sweet Publications this past fall and is available through the Sweet website. Jarod Rosello also read a number of meta-comics—comics about making comics—and we’re pleased to say some new work of his is also forthcoming in our next issue. At Sweet, we’d like to think we are creating a metaphor for a certain type of perfection, a writerly one that explores the possibilities of syntax and meaning and leaves the reader satiated. And in this search for perfection, we are delighted to meet others on a similar journey. So thank you for supporting Sweet and the literary arts. And check out our newest issue, 8.2, that will be released in January.